One of the most beloved and admired members of the National Chimney Sweeps Guild isn’t actually a chimney sweep. Legendary mason Chris Prior, inventor of the Prior Fire masonry fireplace, donates time and energy every year to Sweep’s Week at the CSIA technology center in Plainfield, IN, constructing incredible things out of bricks and mortar. His homestead in Upstate New York serves as the domicile of the New York State Chimney Sweep’s Guild Annual powwow. His Santa Claus beard and the twinkle in his eye have been familiar, reassuring sights at guild conventions for many years. He serves as sort of an unofficial liaison between the National Chimney Sweeps Guild and the Masonry Heater Association of North America (MHA). At the NCSG he and Steve Bushway manned the MHA booth at the NCSG trade show. I asked Prior about his role as ambassador between chimney and masonry trades. “It’s a perfect marriage,” he said of the strengthening bond. He said each group has knowledge that benefits the other group. Prior’s seminar on masonry heaters at the 2016 NCSG convention represented a new high point in the relationship between sweeps and masons. A giant room at the Rosen Plaza was filled to the brim with chimney sweeps, eager to learn anything Prior has to teach. Although Prior could be seen working on his PowerPoint in the main foyer of the hotel until a few minutes before he presented it, his seminar couldn’t have been better. It was clean, streamlined, informative, educational, and entertaining, and it established him as perhaps the world’s foremost expert on masonry heaters. Prior began by discussing humankind’s earliest use of fire to stay warm and to cook food. In Western Europe, he said, people were mostly intrigued by the flames themselves, and they enjoyed looking at the fire and getting warmth directly from the flames. In Eastern and Northern Europe, however, people became fascinated with how the heat from the flames could be stored in the rocks around the fire pit. That’s why, Prior explained, as centuries went by, Western Europe turned into more of a fireplace culture, where folks liked to sit around the fire looking at the flames, while Eastern Europe developed the technology of the masonry heater. The Colonial United States was primarily settled by Western Europeans, he said, which is one of the reasons masonry heaters are not very well known in the US. He then launched into the most concise, complete, and informative discussion of masonry heaters I have ever seen or heard. His talk covered the five basic designs of masonry heaters (Finnish Contraflow, Swedish 5 Run, German/Austrian Grundofen, Russian Heaters, and the newest type, called Bell Heaters.) He covered strategies for servicing each kind of heater, and he covered the principles of heat transfer, including conduction, radiation, and convection and how they relate to masonry heaters. As any chimney sweep who has passed the CSIA exam should know, radiant energy emitted from a hot surface travels through the air in radiation waves. What many of us may not know, though, is that radiation waves emitted from a hot metal surface has a short wavelength, whereas radiation from a masonry surface has a much longer wavelength. Longer wavelengths of heat radiation are more comfortable to live with, Prior said. That’s one of the reasons why heat from masonry heaters (and soapstone wood stoves) is so much steadier and more comfortable than the heat that comes from from steel or cast iron wood stoves. A masonry heater is like a battery, he said. When you fire it, you are charging it with energy. Then, the heater does its job and distributes the heat through the space via conduction and radiation over the course of the day. The mass of the heater holds and distributes the heat more evenly than other types of heaters. A typical masonry heater is fired once or twice a day, for about an hour, and keeps the house warm 24/7. been in use for thousands of years in Europe, they were even used to heat the roman bathhouses in ancient times. Prior did mention that Mark Twain, the great American author who lived in the 1800’s, encountered and wrote about masonry heaters when he was traveling in Europe. Somehow, Prior was able to summon Twain’s ghost from somewhere in the darkness of the audience, and the spirit of Mark Twain, in a southern accent, spoke Twain’s own words to everyone in attendance: One firing is enough for the day; the cost is next to nothing; the heat produced is the same all day, instead of too hot and too cold by turns…America could adopt this stove, but does America do it? The American wood stove, of whatsoever breed, it is a terror. There can be no tranquility of mind where it is. It requires more attention than a baby. It has to be fed every little while, it has to be watched all the time; and for all the reward you are roasted half your time and frozen the other half. Many experts agree with Mr. Twain and consider masonry heaters to be the most efficient way to heat with wood. The masonry heater association is a valuable resource for sweeps who need help figuring out how to service or fix masonry heaters. Their annual meeting, a week long festival of classes and workshops in the mountains of North Carolina, is growing in popularity. For more information about masonry heaters and the masonry heater association, including a directory of members, go to http://www.mhanet.org/ . 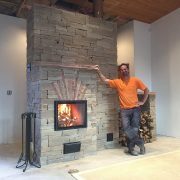 Interested in a custom masonry heater for your home?